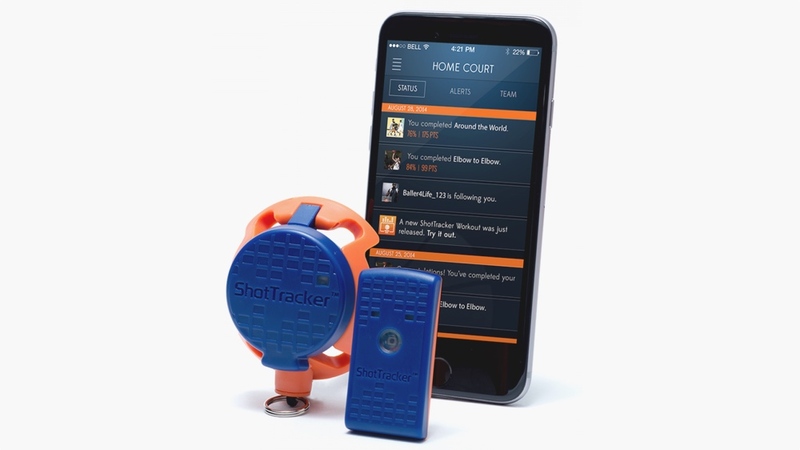 After reading the headline you could be forgiven for thinking that we're covering the new ShotTracker wearable basketball coach system simply to cram in as many NBA Jam references as we can. "Ugly shot," we say. How could you think that lowly of us? We're all over sporty wearables like a magic carpet ride. The nail in the coffin? Sorry, we'll stop now. Back to the actual news and the ShotTracker system comprises of three aspects: the wearable itself, a net sensor and an app for all the analysis. Essentially, as you probably guessed from the name, it's a system to improve your bucket chucking - there's nothing here to help you with your dribbling, passing or off-the-ball movement, although you may find help for these parts of your game within the app that also packs coaching drills. The sensor, which weighs less than 10g, is worn by the player inside a sleeve or wristband (there are ShotTracker branded ones, of course) and packs in a six-axis motion processor. Combined with the Bluetooth-powered net sensor, which simply clips on to the basket keyring-style, you'll get real-time info on your shooting accuracy and a map of your basket attempts. The app is split into two parts - one for players and one for coaches. On the player side you can compare your stats with your teammates and see the drills and workouts your boss has assigned you. For coaches you'll get analysis on your best starting five and be able to send drills and exercises to players who are under performing. The system costs $149.99 and you can grab one now. If you want the branded sleeve, that's $20.